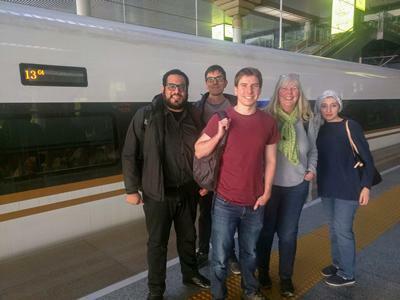 A group of students were invited to participate in a two day workshop at the Nanjing University of Science and Technology, China, between 30 October and 3 November 2018. This was an opportunity for our Web Science iPhD students to see how research is carried out in China and Singapore and to participate in a NExT++ workshop. The workshop began with an opening by Professor Chua Seng (National University of Singapore), Prof Sun Maosong (Tsinghua University) and Prof Wendy Hall (Web Science Institute) and continued throughout the two days exploring the topics of Health and Finance with the lens of AI and high-performance computing. A whole range of issues was covered, from improving student wellbeing to blockchain applications in central banks’ money supply operations. You can read more about the trip in a joint report written by Peter, Sarah, Fernando and Juljan below.